The way we do business and how we consume has changed greatly thanks to an economic phenomenon: the sharing economy. At BlaBlaCar, this economic system is central to our vision, but what is the sharing economy and how are we living in it? Imagine a world in which we share a ride with someone we’ve only met online. A world in which you hand over the keys of your apartment to a visitor. A world in which you trust a stranger with stuff that you own. This world is real. And you’re living it. This global revolution — enabled by economic developments, consumer behavioral shifts and interconnectivity — has allowed us to break free from the limits of the past by doing what we do best: collaborating and sharing at an unprecedented scale. Oxford English Dictionary defines the sharing economy as “an economic system in which assets or services are shared between private individuals, either free or for a fee, typically by means of the Internet.” So in other words, you need something? If I have it, I’ll share it with you. It’s a system in which you and I can access stuff that is owned by someone else. And thanks to technology and smartphones, we aren’t limited to just our next-door neighbors. We now can access an entire network to find each other — in most cases, through a simple app. It makes the most of underused assets or services such as filling empty seats on the road or an sharing a vacant apartment for a weekend. The concept behind the sharing economy has been around for centuries. In need of a hammer? Ask a friend or a neighbor. Don’t have access to a car? Borrow a colleague’s. At its core, the sharing economy gives a person access to something they don’t own through other individuals. It’s certainly not a new idea, but it’s one that’s transformed the business landscape. In the past century, we’ve trained ourselves to desire ownership over things. It’s what is otherwise known as the consumer itch. But then the Great Recession happened. Suddenly, we needed to cut back on buying stuff. We slowly started to question our need for possessions. Could you afford that expensive item if you’re out of work? Could you take out a mortgage during such uncertain economic times? Then there was the skyrocketing jobless rate that hampered the frequency in which in we consumed. The financial and practical constraints of ownership shifted people toward accessing each other’s idle assets. People started to channel their inner capitalist and realized they could make money off their underused assets. The economic reality of ownership wasn’t appealing any longer, especially with expensive and maintenance-heavy products. Cars and homes are good examples, with platforms for peer-to-peer carsharing (Drivy, OuiCar, GetAround), carpooling (BlaBlaCar), home exchanges (LoveHomeSwap), or short-term rentals (Airbnb). The advancement of technology and social media in the 21st century gave new meaning and depth to the sharing economy. Now, people had different channels and sharing practices to grow their community and connect with others outside of the traditional network through mobile devices and high-speed Internet. With the introduction of Facebook (which gave people online profiles), GPS-enabled phones (which made locations easily findable) and Internet marketplaces like eBay and Amazon (which made it popular to exchange goods with strangers), we finally arrived at the hybrid economy. When you think about it, the sharing economy has enabled new relationships that would historically have been constrained by time, distance, lack of information, and other limitations. Technology isn’t giving people a means of shying away from the world around them: It’s giving people the means to extend their circles of trust, and empowering people to connect and interact with others like never before. A more important factor in the rise of the sharing economy was the changing consumer behavior. The 2000 dot-com bubble burst and subsequent global economic downturn eight years later resulted a general disillusion of ownership with consumers shying away from spending. With the economy going south, many consumers, especially millennials, began to turn to the idea of sharing and finding news ways of accessing what they needed. Every quarter on BlaBlaCar, close to 12 million members share long-distance car rides with each other. In this society of sharing, people hail from different walks of life with various professions or cultures; people who would have never met otherwise and who chose to share a ride. 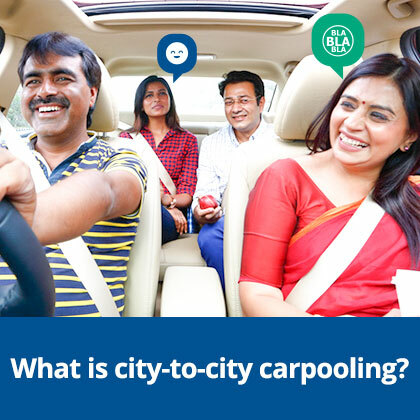 Half of our members say carpooling has made them more open to others. Thus, the perception of “the other”, of “strangers”, changes and the circle of people you trust widens dramatically. We recently worked in close collaboration with NYU Stern Professor Arun Sundararajan, author of “The Sharing Economy”, to analyse what creates trust online and the resulting personal connections that this helps to build. Our research, titled Entering the Trust Age, revealed that the use of sharing economy platforms can have a spillover effect: As users familiarise themselves with new social codes and become more trusting of people they’ve never met before, they become more open to trying additional sharing economy services. Unused value is wasted: After struggling to find a ride, Frederic Mazella developed an idea to create a carpooling service. All the seats on the trains going in his direction were full, but not the ones in the cars (aka unused assets). The experience motivated him to reorganize wasted capacity in the form of carpooling. Access trumps ownership: Today’s generation of consumers are less interested in traditional ownership, favoring renting or borrowing assets that suit their flexible lifestyle. Access also means that we can easily overcome deterrents (like not having a driver’s license or being able to afford expensive train tickets), making us more mobile than ever before. Trust: Globalization paved the way to an interconnected world for enterprises and nations. With time, the interconnectivity weaved online social communities with virtual reputations that allow us to more easily collaborate with strangers. You used to share things with your family and your friends. And now, you share things with strangers. In this world, everyone is sharing. We are now empowered to share goods, knowledge, money, skills, network, content, etc., through various platforms. We’ve regained our ability to contribute more directly to society and the economy, but on a global scale. All of these developments give form to the sharing economy that we are living in today. So what are you waiting for? Enter the world of the sharing economy and carpool on BlaBlaCar!